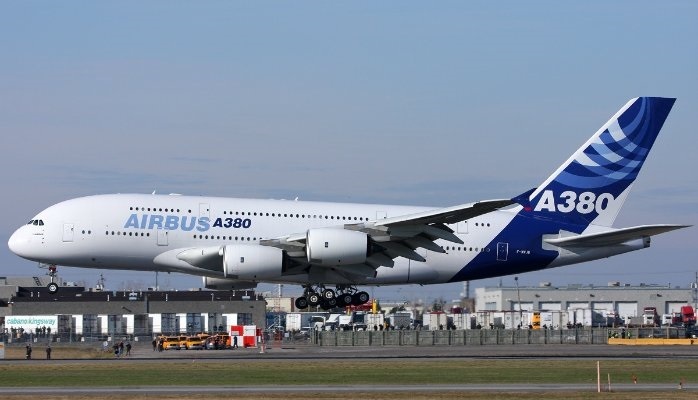 The double-deck A380 is the biggest commercial aircraft. With a seating capacity of 853 passengers, it accommodates 525 passengers in a typical four-class configuration. The cabin consists of main and upper decks. The power plant of the world's biggest passenger aircraft includes four Rolls-Royce Trent 900 engines. Interestingly, the cabin air is recycled every three minutes to keep the atmosphere fresh, while natural light is provided by 220 cabin windows in the aircraft. Take off weight: The maximum weight that a pilot is allowed to attempt to take off. Powerplant: A part of the propeller unit, it varies according to the capacity, purpose and desired speed of the aircraft. Fuel: Aviation fuels have anti-freezing and anti-explosion properties. Cruising speed: The speed at which an aircraft travels after reaching the set altitude. Average speed of commercial aircraft is 400-500 nauts. Range: This is the maximum distance an aircraft can cover between landing and take off on the basis of its fuel capacity.